Recruitment ads are often thought of as boring or dull. As such, Domino’s Pizza Malaysia decided to put a creative twist to its latest ad. 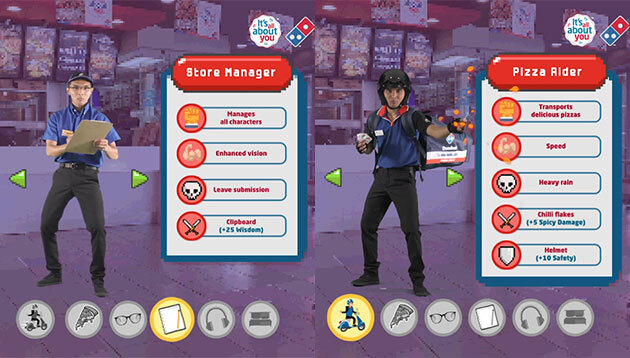 The gaming-themed recruitment video on Facebook features different positions available at Domino’s, such as manager-in-training, delivery rider, pizza maker and call centre agent, portraying them as video game characters. Instead of the usual lengthy job descriptions, the video urges interested applicants to select a video game character of their choice, each with its special strengths and abilities. Speed, for example, is listed as the pizza delivery rider’s strength while the special skill is chilli flakes, which can inflict 50% damage. Meanwhile, the pizza maker is said to have quick hands and is able to inflict 50% damage with his or her bare hands, as well as using a pizza peel. In the Facebook post, Domino’s said that much like video game characters, real-life professionals have their own special abilities, strengths and tools. The post garnered 314 reactions, 56 comments and 269 shares at the time of writing and was done in collaboration with social media agency 16TWO. Netizens’ reactions have been mainly positive, with some expressing interest in applying for a job with Domino’s, while others commented that they loved the creativity behind the video. In a statement to A+M, Domino’s Pizza Malaysia and Singapore’s senior vice president, marketing, Linda Hassan, said recruiting for talent can be tough and the company wanted to approach it differently, targeting the younger consumers in particular, while remaining true to the Domino’s spirit. E-sports is currently on the rise and is an area that is relevant to its targeted recruitment audience, she said. “The concept of creating an e-sports gaming video comprising various gaming genres such as arcade, RPG, 8-bit and fighting game integrated into positions as well as the criteria needed at Domino’s, was to demonstrate the opportunities available for different skills sets that one may have,” she said. Linda added that the video shows that each player has a role to play and this reflects the reality and importance of teamwork at Domino’s. Last year, the company officially launched a localised brand promise known as “It’s All About You”, to reflect its value of placing consumers first. Linda told A+M in a previous interview that sales will naturally come in if customers are satisfied. “There is no point communicating and promising something when the customer experience is not what consumers are expecting,” she said, adding that while some brands in the market might have a huge budget to advertise and engage consumers on every platform, the actual customer experience still matters at the end of the day. A sell off imminent for the media trading technology company. ..